In a world filled with political unrest and tragic violence, it almost seems too much to glorify war. Then again, as the "Call of Duty" series has always argued, sometimes the road to peace is littered with shell casings. After three successful iterations putting players behind the rifle of a World War II foot soldier, the "CoD" series moves into the hypothetical near future, where a military coup in an anonymous Middle Eastern country combines with a breakaway Russian faction to threaten the stability of the entire planet. At the hint of a nuclear apocalypse, the game puts extreme measures and escalating body counts into the player's hands as the only expedient solution. Players might find the politics of this scenario unsettling if only the game gave them a chance to reflect. 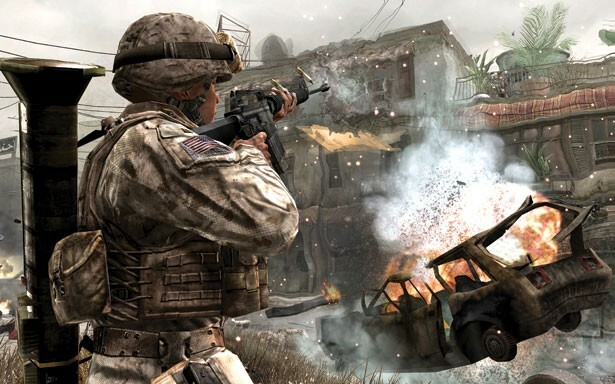 Instead, "Call of Duty 4: Modern Warfare" provides a tensely paced and perfectly balanced machine-gun narrative that doesn't let up until the grand finale. Although it's short by first-person-adventure-game standards, the edge-of-your-seat gameplay gives you the feeling of living out an episode of "24" rather than slogging through an entire world war. Whether you're playing the new man on an elite Special Air Service team sent to retrieve nuclear arms from a heavily guarded ship at sea, or a Marine grunt clearing a dusty village of enemy troops block by block, the action sequences pile on top of each other. It's all rendered in such vivid detail that it's easy to take your eyes off the enemy drawing a bead on you from a distant rooftop as you admire the scenery. And just when the treadmill of slaughtering bad guys starts to grow routine, the game mixes things up by putting you in the body of a political captive facing execution or a gun operator laying down fire from an AC-130 Spectre, lumbering thousands of feet above the battleground. Eventually, a detonated nuke and a visit to a devastated Chernobyl bring home the seriousness of global politics and suggest that a few dedicated soldiers in the right place at the right time can pull a Superman and save the world. And that theme, more than the polished gameplay and gaga graphics, makes "CoD" work. Our need for these heroic narratives seems to come down to the simple fact that if we have heroes, then we have a way of thinking about evil. The complexities of the real world and the endless shades of gray in the war on terrorism fade into the simple, black-and-white format of most war narratives. In this way, "CoD 4" gloriously recasts the divisive events in our real-world Middle East as a bullet-ridden game of chess where the only moral moves you can make have you surging forward in pursuit of a lunatic who's bent on destroying the planet. "Call of Duty 4" is a blast to play. But it's also political poetry that soaks in long after you've beaten the final level. Rich in story and soaked in combat, this is the first-person shooter for people who think they have grown tired of the first-person shooter. The first-person shooter has gone through something of a renaissance lately. With games such as "Call of Duty 4," "BioShock," "Halo 3" and "The Orange Box," gamers now get some thoughtful plot to go with their head shots. The single-player campaign in "CoD 4" blows by pretty quickly, compared with those of other first-person-shooter games. But the online multiplayer takes up the slack, providing plenty of reasons to keep responding to this call of duty.